the writing system of the ancient and modern Jews who speak Hebrew, Yiddish, and Ladino (Judeo-Spanish). Data of the Old Testament indicate that Hebrew writing existed as early as the llth century B.C. The most ancient Hebrew inscription (the Gezer Calendar), which dates from the tenth century B.C., is written in the Canaanite alphabet, which is very close to the Phoenician. A shift to the use of the Aramaic (square) alphabet, which at that time was spreading throughout Southwest Asia and, with insignificant changes, is still in use, began in the mid-fifth century B.C. Until the mid-second century A.D. the Canaanite characters continued to be found in certain cases (for example, on intaglio and coins). Variants of the square alphabet, as well as a number of cursive forms, came into usage in the Middle Ages. These alphabets consisted of 22 consonants; vowels, which in Semitic languages express grammatical form, were usually not written. With time, however, the consonants h, w, andj began to be used to indicate the presence of certain vowels (matres lectionis), and in the seventh and eighth centuries various diacritical marks and subscript signs were used to represent vowels in the Bible, poetic texts, books for children, and textbooks. 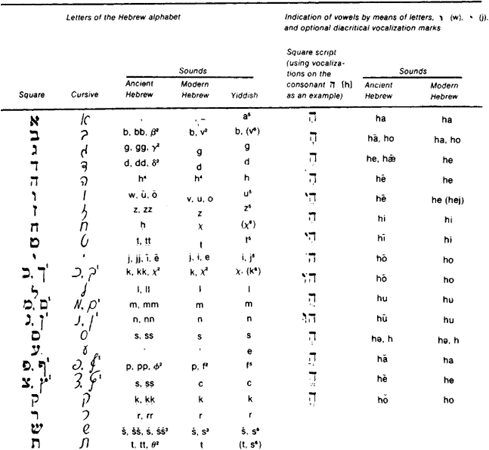 process of transformation of a consonantal writing system to a phonemic system (one that indicates vowels) was completed in Hebrew writing used in non-Semitic languages, such as Yiddish (see Table 1), the Romance language Ladino, and Karaite (a Turkic language). In addition to square writing (the common typeface) and modern cursive, which originated in the cursive of German and Eastern European Jews, there are other forms of Hebrew writing: Rashi (the traditional writing used in commentaries to the Bible and Talmud); Taich, or “women’s,” writing (the typeface of Yiddish of the 15th through 19th centuries); Sephardic cursive (used among Jews of Spanish descent); and Moroccan and Italian cursives. A complex system of subscript and superscript punctuation marks that indicate the semantic unity or division of the elements of the text, as well as the place and intensity of stress in ritual readings, was used in biblical texts. In modern Hebrew the European punctuation marks are generally used. Evreiskaia entsiklopediia, vol. 2. St. Petersburg [no date]. Vainraikh, M. Di shvartse pintelekh. Vilnius, 1939. Fal’kovich, E. “Idishe grafik un ortografie.” In Idish. Moscow, 1940.